A Tour of My Beauty Storage! 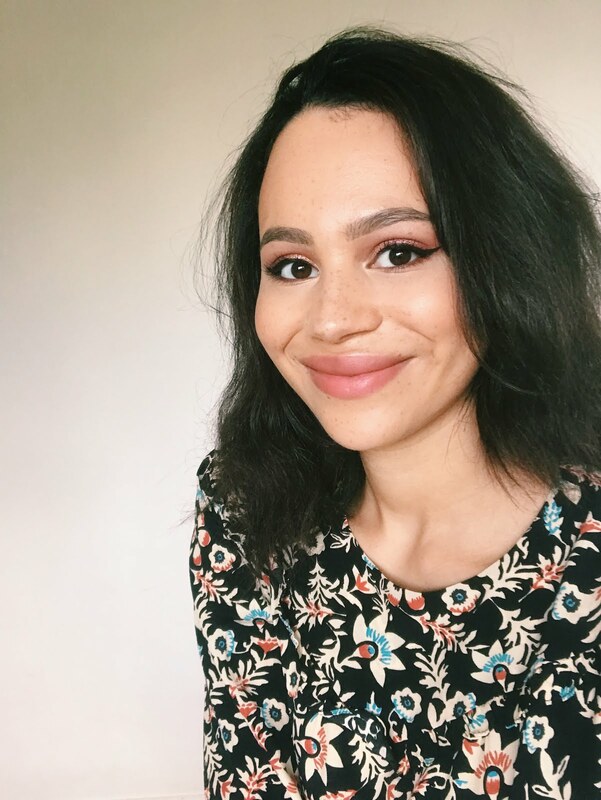 Beauty tours are one of my favourite things to watch in Youtube and I'd love to see more of them on blogs! Hopefully I'm starting a trend haha. I kept putting off posting this because I didn't feel my set-up was quite where I wanted it to be - but there's nothing stopping me doing a new post in a few months time when it all changes! On the desk itself is where I keep my large brushes, which are mostly from Real Techniques. 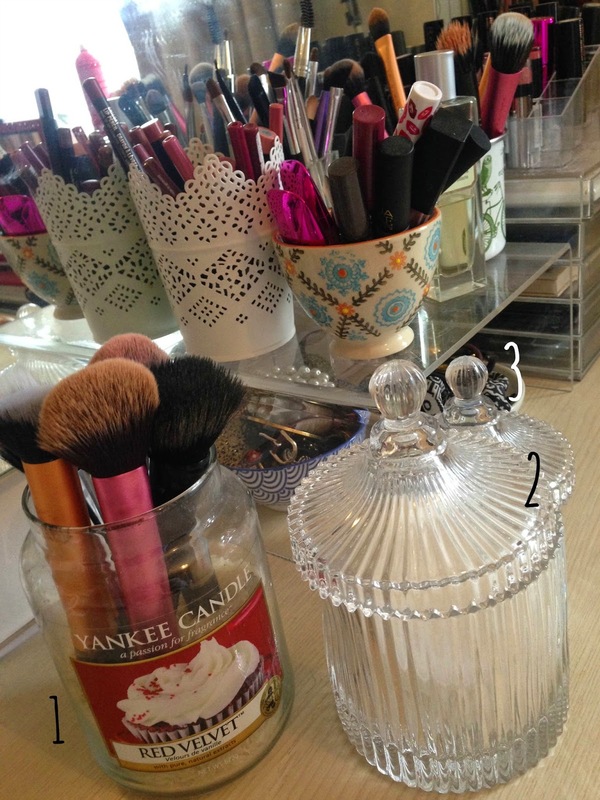 (1) is a cleaned-out Yankee Candle jar (I posted on how I did this here). Not really beauty but at (3) you can see a little ring disk (I think from Marks and Spencer) that I use to hold hair ties and grips. Next to it I have a small bowl by DotCom GiftShop that I use to hold loose jewellery I wear the most like rings and earrings. I got this large desk tidy (4) for under a fiver from Muji - I like that the clear acrylic matches my storage boxes and the fact it allows you to have things underneath and on top of it. I hold all my lip gloss, cream and lacquer products in a little teacup (5), which is again by DotCom GiftShop and I believe this is £5-6. Just next to it is my ultimate indulgent winter perfume (6) - Laura Mercier's Eau Gourmande Fragrance in Creme De Pistache. (7) is a mug by Sass and Belle. I have all of my smaller face brushes in here, mainly e.l.f. and Real Techniques along with hair dividers and the Real Techniques beauty blender (which I don't really use at the moment). (8) is actually a candle holder from IKEA, which I thought was so pretty and was only a couple of pounds. It's perfect for storing lip pencils! (9) is again really cheap and I got it from Muji for my eye brushes. Now it's into my two beauty-dedicated drawers. The top one is where I have my skincare (plus some other miscellaneous things...) and the desk tidy was, I believe, £5.99 from Homesense. I keep all my basics and backups of them in this drawer (10) like baby wipes and cotton wool pads. I have my other perfumes in here too (11) but I really need to find a better/prettier place for them! My auntie very kindly gave me her Clarisonic Mia (13) so now I need to pick the perfect head for it and I'm good to go. I'm so excited to try it! I also have a Tangle Teezer (14), which I keep in here for reasons...I use it to brush hairspray out of my hair before I go to bed. 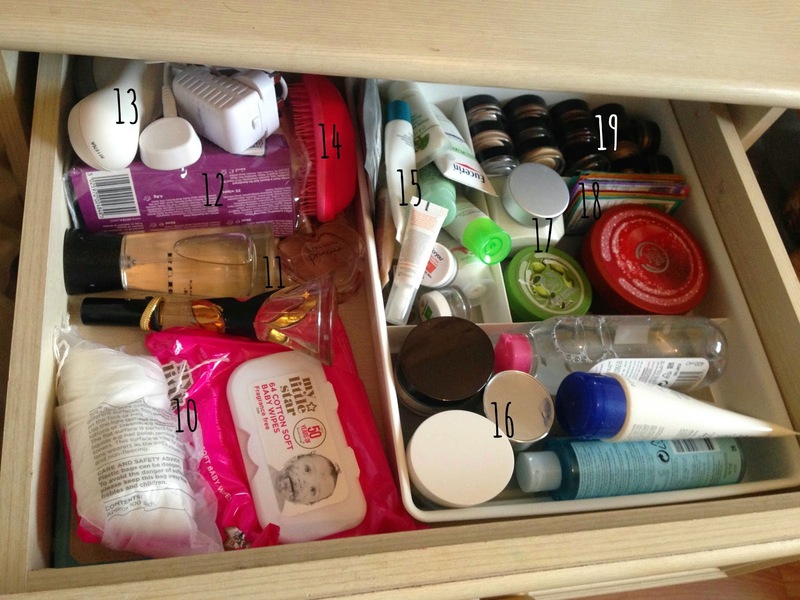 (15) is the compartment where I keep all the smaller tubes of cleansers, serums and eye creams. I have brands such as Origins, Vichy and No7 in here. (16) is my moisturisers and larger tubes of cleansers, night creams and toners. In here there's some Clinique, Garnier and La Roche-Posay. (17) is body butters, I have a couple from the Body Shop and the Laura Mercier one to match my perfume. (18) is some little samples I got from Jason* at an event, which I really want to try out! It isn't the ideal place for them but at the back (19) I also have my cream eyeshadow products. They're mostly Maybelline Colour Tattoos but I also have some e.l.f., Max Factor and Mememe Cosmetics. In my second drawer I have this fantastic Godmorgon organiser from IKEA (21), which was £15. I really like keeping my foundations and tinted moisturisers (20) in here as it means I go in this drawer every day and the stuff in it doesn't get neglected. 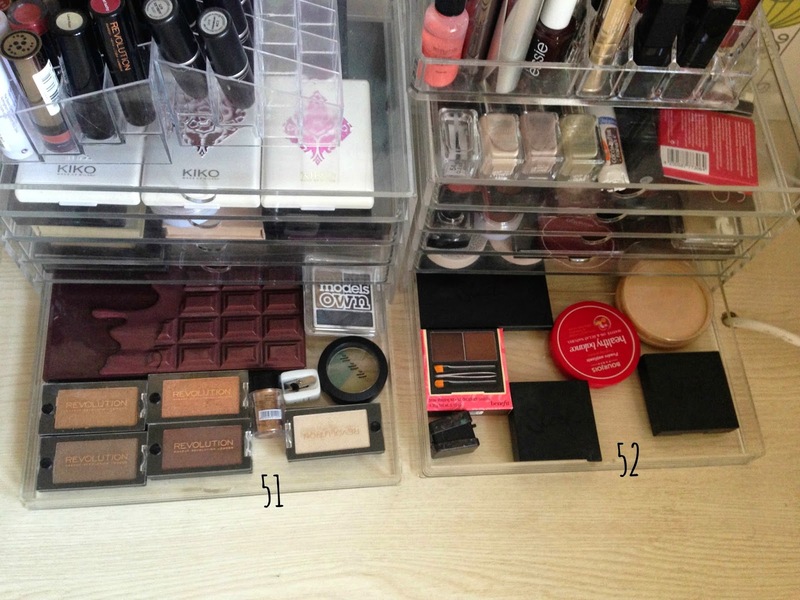 These compartments are pretty much perfect for them! I won't show you behind as it's not very interesting - basically just spare brushes! These little compartments are just fab! In (26) I have products that don't fit anywhere else...including my e.l.f. cream blushes, some Benefit concealers, a Topshop Glow Pot and some Bobbi Brown eyeliners. In (27) you can see I mainly have fixing sprays and primer products. (28) is all my mascaras, which are mostly quite budget but I do also have Benefit's They're Real. (29) is my Makeup Revolution Vivid Blush Lacquers, which are AMAZING! 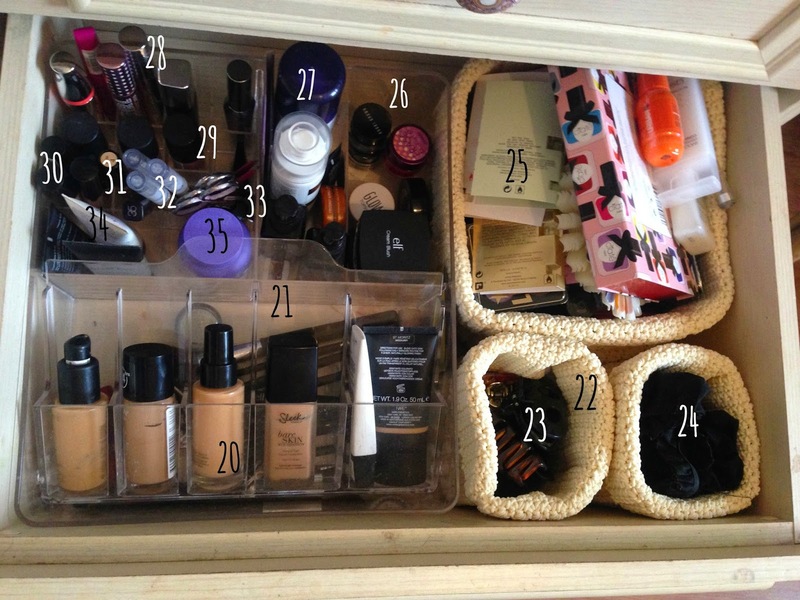 You also probably can see this better in the below image, but (30) is where I keep eye primers. 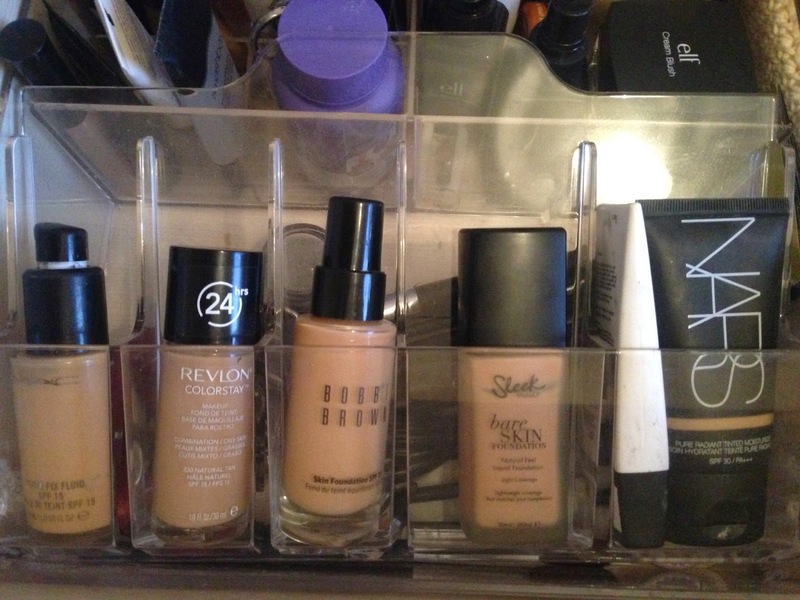 (31) is creamy concealers from Maybelline, Collection and Nars. At (32) I have my brow gel (from e.l.f., which also has a clear mascara end). (33) is a million pairs of tweezers and nail scissors! 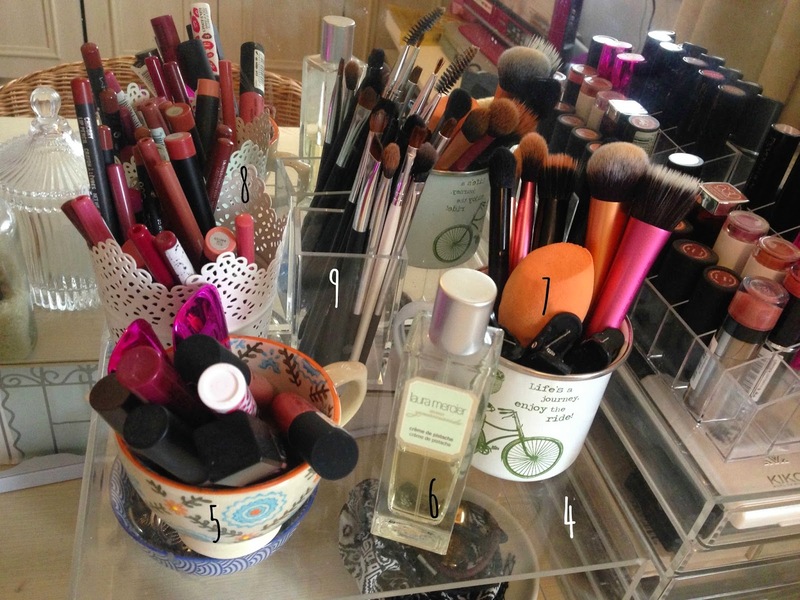 (34) is where I keep all my face primers, from Rimmel to Smashbox. (35) is my trusty Bourjois nail polish remover. I also have a couple of the famous Muji acrylic 4-drawer boxes (42). These are £25 each - you can get some a little cheaper on Amazon but personally I preferred the look of the handles on this so it was worth spending a little more. It's totally up to you! 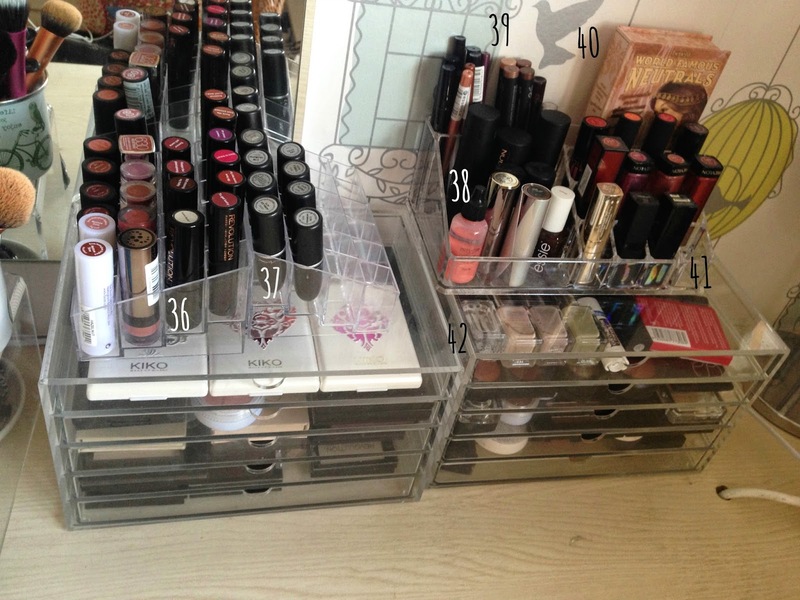 I have 2 of the same lipstick holders on top, which were a couple of pounds from Amazon (I believe they ship from HK). In one of them (36) I keep all of my budget lipsticks including my Makeup Revolution Lip Hugs and a few Sleek True Colour shades. In the other (37) are my MAC lipsticks. 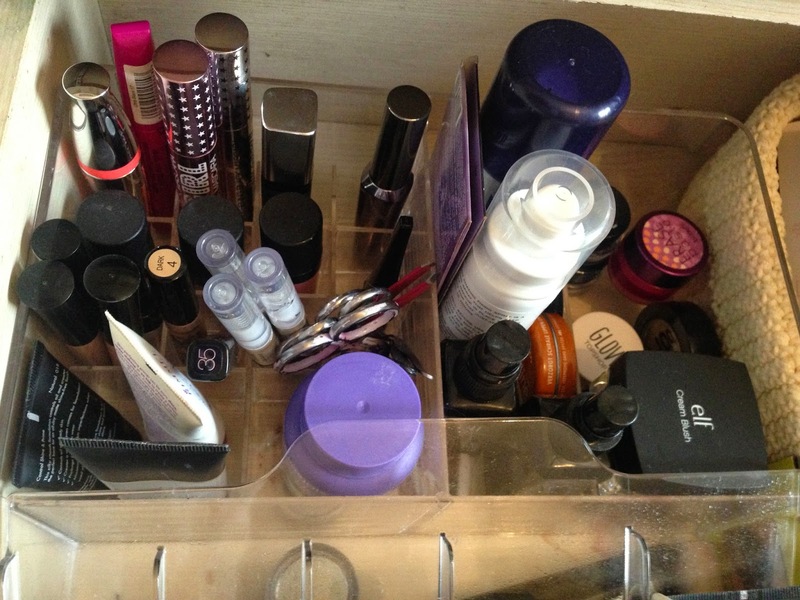 Another Amazon find is on top of my second Muji box - I believe this cosmetics organiser was around £8. At (41) are all my non-MAC high-end lipsticks and mid-priced ones. I have some from KIKO, Topshop and Illamasqua. I keep in the front of it (38) pretty much anything that doesn't fit elsewhere! This includes blusher sticks and a fluid blusher. (39) the back of this organiser, where there are 2 compartments. I use the left-hand one for eyeliners and the right-hand side for shadow sticks. 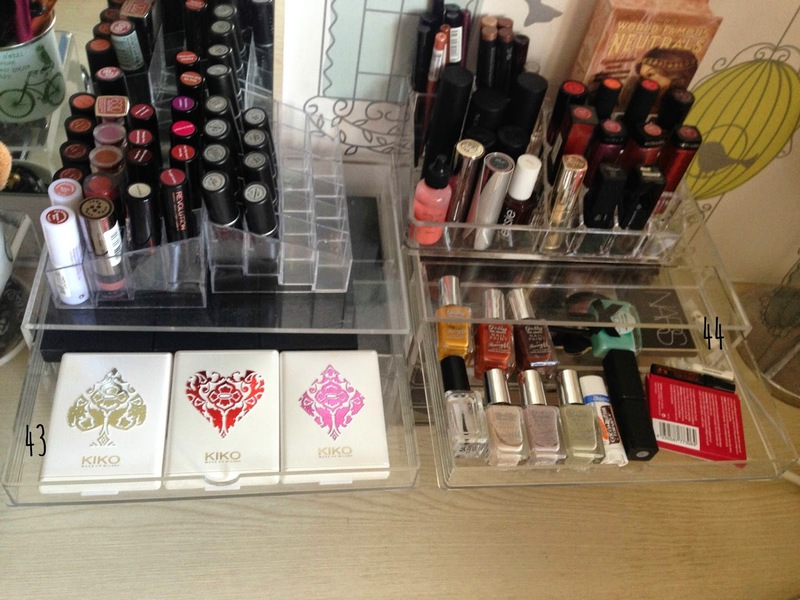 I use the left-hand drawer (43) for storing compacts from KIKO's Daring Game Collection and Sleek's Lip4 line. (44) is a bit of a mish-mash! I don't generally keep nail polishes on my dressing table but these are some of my most-used shades. I have Barry M and Ciate* shades. Plus I have my e.l.f. lip exfoliator and a Palmer's lip balm. There's also a mini Benefit eyeliner, some eyelash glue and some Essence matte blotting papers. To the left (45) I keep all of my budget blushers. 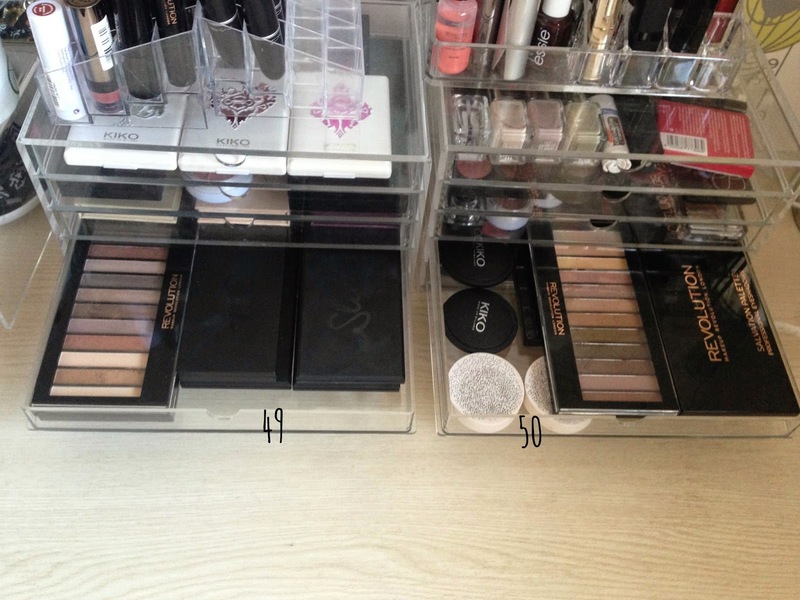 I have palettes from Sleek and Makeup Revolution and some singles from Sleek and Natural Collection. 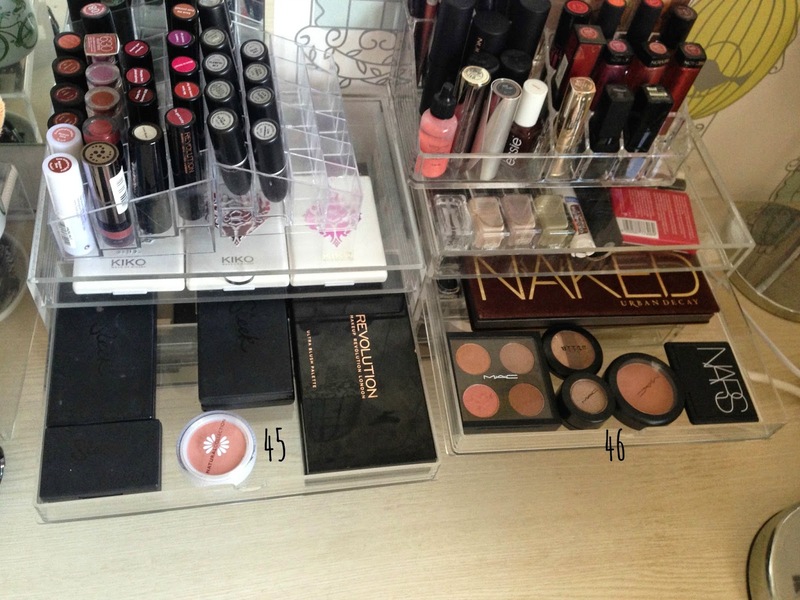 On the right (46) are some high-end blusher and eyeshadow products. For the third drawers down I have more budget eye products. 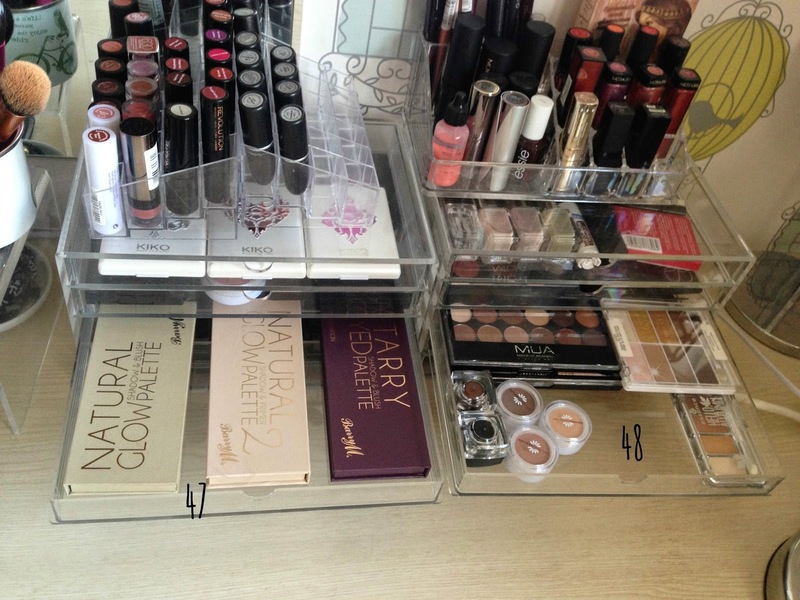 My Barry M eye and blusher palettes (47) are on the left. The other drawer (48) stores eyeshadow palettes from MUA, Essence and Wet N Wild as well as single Natural Collection eyeshadows and some amazing e.l.f. cream eyeliners. Yes, it's even more budget eye and cheek products...I just really like palettes! On the left (49) are some from Makeup Revolution and Sleek and to the right (50) I have some individual blushers from KIKO and Topshop and some more Makeup Revolution eyeshadow palettes. Finally, I have even more eyeshadows (51). I have a Makeup Revolution Palette, some of their single eyeshadows and one of their loose pigments, a Model's Own trio (so sad they're discontinuing these! ), a Mememe trio and a random sharpener! To the right (52) I keep my eyebrow and face products. I have 2 brow kits, from Sleek and Benefit, and face powders from Sleek, Bourjois and Rimmel (I also have Maybelline's Matte Maker, but that stays in my handbag). I also keep my Sleek Face Form kit here and if I had any other bronzers I guess they'd be here as well! If you stayed with me until the end: congratulations! 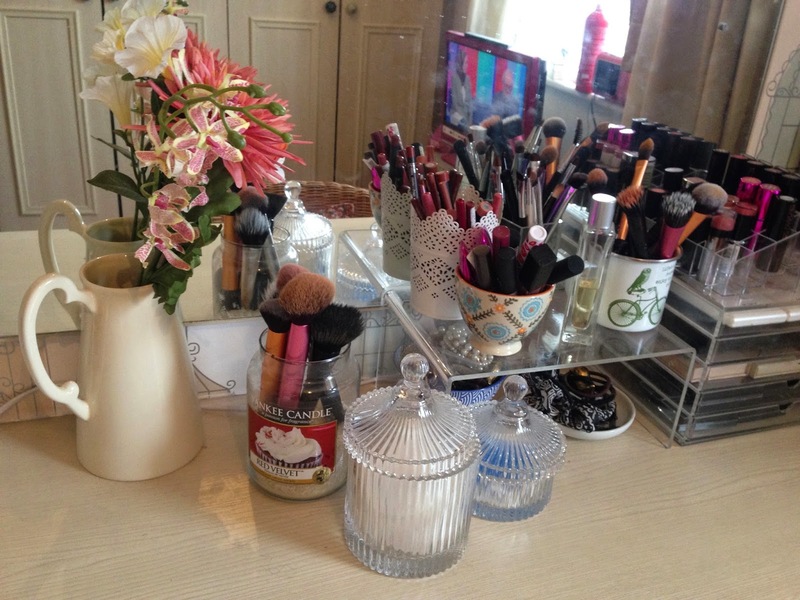 Hopefully you enjoyed this and have maybe got a few little tips on how you may like to store your makeup. 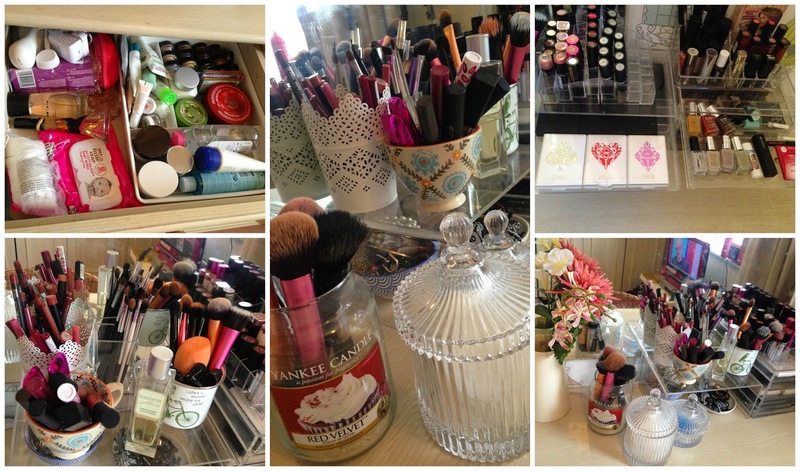 I'm jealous of your organization skills - I need to get some of them cute pots for my brushes! WOW great collection! Mine's probably a fifth of that haha! Great post! I love your storage - the jewellery bowl is so so pretty! Love your storage and I'm so jealous of the baskets from IKEA. I have been trying to get them for ages! I want my brushes to look as pretty as yours do! Your storage is so pretty! I love what you've done with the little bowls and mugs. My storage isn't ready for my blog yet because of nowhere to display it nicely in student accommodation, maan! Wow, i love your collection! I love seeing other peoples, but it always makes me want to buy more! 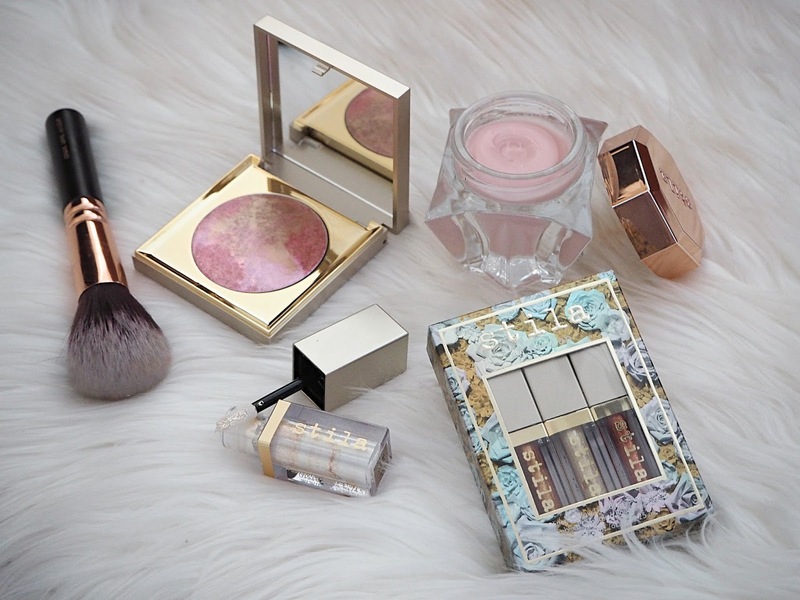 First of all, what an awesome makeup collection! 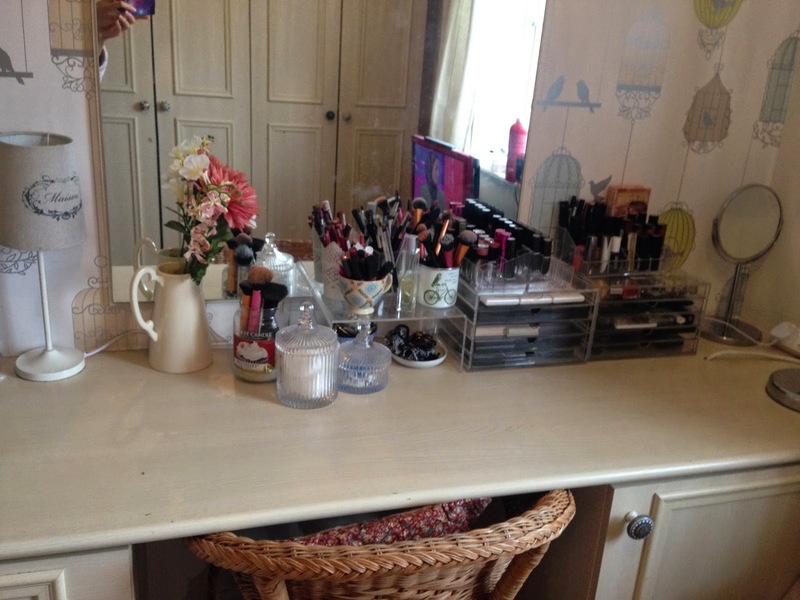 I wish I had a dressing table to put everything on and I need to get more acrylic storage! I have a similar jar as #2 from 99p store and I use it to hold my beauty blenders. Great post!! Wow you are so organised! I must look into those Muji storage but at £25 they are quite expensive, I could do with a fair few of them!